It’s almost 90 degrees outside and you are sitting on your front porch sipping on an iced tea, dreaming about that huge Buck that stayed just outside of your range last fall. While your entire family is enjoying time in the pool you are counting off the days until hunting season rolls around again and you can once more climb into your tree stand. A hunter in the summer is like an iceberg in Florida, it just doesn’t fit. Although I love many things about the warmer months, there is something about the Fall that touches my soul. Whether it’s the changing leaves, watching farmer’s harvest their crops or the sight of big Buck walking across a field in a morning mist, there is just something about that special time of the year when a chill hints in the air, yet it leaves me with a warm and fuzzy feeling. If you are a lot like me, and many others who feel a bit lost in the Summer, here are few ideas of what Hunters can do in the summer to bide their time until Deer hunting season is once again here. 1. Hog hunting: In many state the wild pig population is out of control, so try to contact some farmers or land owners who may let you hunt them on private property. If that doesn’t work out an occasional guided hunt can be had for about $200 in many areas. Even the not so fair chase operations can be used to hone your skills if you try shooting from distance. But please don’t call this hunting, it’s more of practice and a day out with the guys, but still fun. At least make sure the outfitter is reputable as we try not to give business to those involved in canned hunts. 2. Work your dogs: Train your dogs lightly for next Pheasant hunting season. It can be done on private land with farmed birds or just go for a walk in pheasant country to see what you can see. Don’t let the dogs get too overheated and don’t do it too often, as it may push the birds away for next season. 3. Check your hunting equipment: If you are anything like me, you have quite a few giant plastic bins filled with all manner of hunting equipment, including enough camo clothing in various styles and thickness to outfit a platoon. Take this time to organize and review all of it. If it’s worn out replace it or fix it. Donate some to charity. Clean all your non wearable essentials, tools or pretty much anything you use on a consistent basis. Have it all ready for the fall. This takes time. 4. Buy New Hunting gear: Donating hunting equipment is preferable but you can also put some use hunting equipment up for sale in order to buy new stuff. 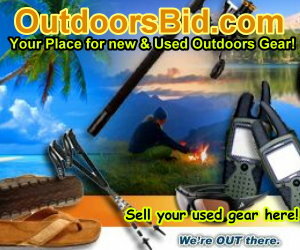 Auctions sites like OutdoorsBid.com (opening soon) caters to Outdoorsmen who want to sell their used sporting equipment before buying new. Selling old hunting equipment allows you to lessen the cost of buying new and you have less expense to justify to the wife! 5. Scare the neighbors: The look on people’s faces when they pass by and notice the crazy man on the front porch cleaning knives and rifle parts is priceless. You may even get to know the local police on a first name basis when they come to check out the calls they will receive due to your diligence in keeping your equipment in fine shape. Keep plenty of doughnuts on hand for these occasions. 6. Practice, Practice, Practice: Quality hunting equipment is one thing but a quality hunter makes all the difference. Practice the shots you will most likely take during hunting season at an outdoor range. Try different types of ammo that you may use for various game. Learn about trajectory, range, weight and any other information you can think of to make you not only a better hunter, but a safer one as well. This goes for Bow hunters as well regarding broad heads, bow strings, draw weight, etc. 7. Hunting Boots: There is nothing worse than heading out to your hunting blind for an early morning Turkey hunt, or walking to your Deer blind in the predawn hours only to step in a puddle and discover you will have wet feet or the rest of the day, which could very well be cut short. Check your hunting boots for wear and leaks and re-waterproof them. If they are too far gone consider purchasing a new pair. After buying a new pair you can then spend the rest of the summer breaking your new hunting boots. Don’t forget you can sell the old ones on OutdoorsBid.com (yes, a shameless plug!). 8. Hunting Quota Permits: Many states have quota hunting permits which allow only a certain number of hunters on piece of public per specified period of time. Figure out where you want to hunt and when the deadlines are for these areas. Make sure you get them in on time as hunting quota permits are usually drawn by lottery for the most desired public hunting land. Send in lots of them for different areas as the odds are pretty much against you, but you may get preference points for next year. 9. Hunting Private land: I am very lucky to have the opportunity to hunt private land in states like Texas, Wisconsin, Florida and Colorado. Contrary to belief, showing up with a smile and a bottle of scotch doesn’t have the effect it may have 50 years ago. Become a friend and mean it. Offer to help a land owner of you see something that needs repair. Don’t expect to be able to hunt private land, but you can hope for it. Again, be a friend first. At the very least you may get some great information on where animals have been seen or perhaps the land owner knows someone else who will let you on their property occasionally. The time to do this is not just before hunting season but year round. 10. Trail Cameras: Set up some Trail Cameras in the areas that you like to hunt, or better yet, find new ones. Walk through the woods and look for game trails. Figure out the prevailing winds at certain times of the year. Notice what animals are using these trails to figure out where they are going and coming from. There are some very inexpensive Deer Cams that you can purchase if you want to place them on public lands and are worried about theft. Watch reruns of Duck Dynasty and try to grow a proper beard! Bonus Hunting tip #1: The Outdoors Channel: Cable television is a great hunting tool. There are just so many hunting shows on television or DVD’s to watch that many older, more portly hunters can lazily spend the summer heat on their lazy boys learning new techniques or improving old ones. Just remember that during season if you are out in the woods but not quite at the right time you have some chance of harvesting an animal, you have zero chance if you are still on your couch when hunting season rolls around. Bonus Hunting tip #2: Take this time to get in shape! There is no ego killer worse than taking the time to use scent killer on your clothes and shower with non-scented everything only to sweat it all up on your hike to your tree stand. It’s more than this, just take the time to get healthy and don’t become an undesirable hunting statistic. Bonus Hunting tip #3: Learn how to fish! Better yet, teach a kid how to fish. Not only will you find a new hobby that you can do year round but maybe get some diversity in your freezer. Basically, what we at TheOutdoorsGuy.com are trying to say is to get out of the house and enjoy the world. Any day above ground is a great day and should be relished. We’re Out There…and you should be too! Don’t forget to pay it forward.